Some dogs suffer from anxiety attacks in certain situations. Dogs, like people, can experience anxiety attacks as a severe reaction to certain stressors. Some dogs panic when left alone. Others work themselves into a frenzy during holiday fireworks or a thunderstorm. Learning the signs and symptoms of anxiety attacks will help you better understand and help your dog. Dogs are social pack animals that often suffer anxiety attacks when their owners leave them behind. Dogs pick up on the subtle cues of your routine and might start acting depressed, tense or excited as you prepare to leave the house. Some dogs excessively pace, bark, whine or salivate, while others may show signs of gastrointestinal distress by vomiting or having diarrhea. Once you're gone, the separation anxiety might manifest itself in destructive chewing, particularly on items that carry your scent. Other signs include urinating or defecating in the house and scratching or digging at windows or doors trying to get out and find you. This type of behavior is likely related to separation anxiety if it occurs only when your dog is left alone. Many dogs are afraid of loud noises such as thunder, fireworks, construction sounds or gunshots, but some dogs experience anxiety attacks whenever these noises alarm them. 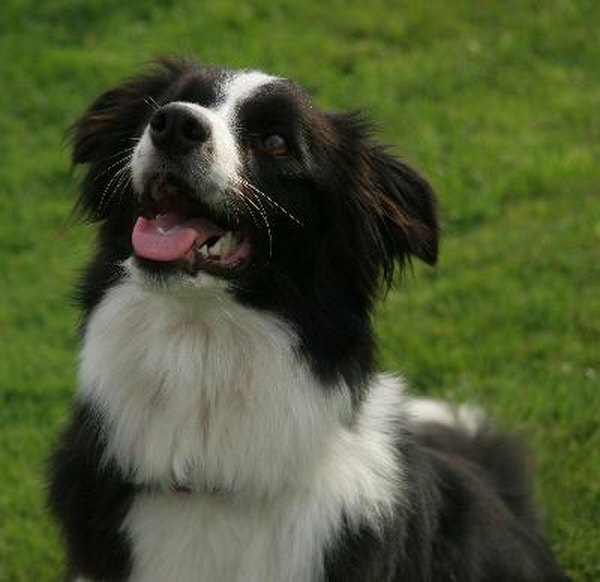 Your anxious dog might want to run from the sound, even trying to chew through doors or jump out windows in order to escape. Other dogs try to hide from the noise, wedging themselves into unusually tight spaces. Still others take the aggressive route, often charging, growling and baring teeth at the suspected source of the noise. Housebroken dogs might urinate or defecate inside. Some dogs suffering from separation or noise anxiety show more subtle signs during panic attacks. Extremely anxious dogs sometimes lick themselves incessantly, often losing patches of fur. Other pets obsessively chew on their toenails or feet. Still others revert back to nursing behavior and start sucking on their own fur. Unfortunately, these obsessive-compulsive behaviors often result in the dog self-mutilating to the point where he causes deep wounds or develops skin infections. Help your dog overcome separation anxiety by keeping your departures and arrivals as calm as possible. Give your dog a "safe place" like a room with a window and a lot of fun dog toys. Take your dog for a long walk before you leave him alone. By spending this time together, you'll tire him out so he sleeps away the time, and he'll start associating your leaving with fun walks. If the separation anxiety continues, talk to your vet about prescribing a mild anti-anxiety medication for your dog. If your dog suffers from noise anxiety, try changing the environment or closing the curtains to help reduce the sound level whenever the noise occurs. You can also turn on the air conditioning, fan, radio or TV to help block out some of the noise. Create a "safe place" for your dog to use during noisy events. Many dogs with noise anxiety prefer smaller spaces, such as their crates or a small bathroom. Be sure to leave any doors open so your dog doesn't feel trapped and become even more anxious. It's best not to reassure fretful dogs during loud noises because you are just confirming there is actually something to fear.